This entry was posted in Beyond Port Rowan in S, S Scale Workshop, S Scale Workshop-Modules, structures, TrainMastersTV by Trevor. Bookmark the permalink. 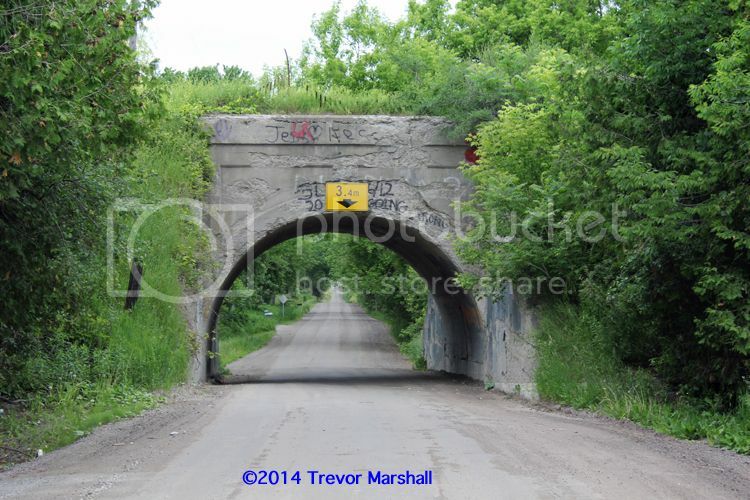 If you backdate things, you can also find some great examples of cut stone culverts – along CN’s Kingston Subdivision, probably on the ex-GWR line to Niagara Falls, certainly on a number of CP branches and the main line (take a look at the route through London). I will be interested in your techniques. One thing that I want to do is install a water tank with a wood stave tub but held up by a circular cut stone base. There were a number of examples along the Ontario and Quebec (CP’s Winchester Subdivision and a bit of the Belleville Sub.) and I saw a David Plowden picture of one at Harvey, New Brunswick. There are some wonderful cut stone culverts and road underpasses still in use under CN railway lines and on abandoned portions dating from almost the construction of the GWR in the 1850’s. At mile 7.7 of the CN Dundas Sub., a couple of miles east of Copetown, is a beautiful stone road underpass. Further west on the original GWR alignment west of Harrisburg was (maybe still is?) another example. Still standing in the Grand River west of this are bridge piers on the old alignment. All would date from around 1853 or so. On the former GWR Air Line at about mile 2 of the CN Paynes Sub. west of St. Thomas is a nice stone culvert that I have walked through. It was lengthened with a concrete extension on its north end in the 1960’s to accommodate a new track to the now-closed Ford Talbotville auto assembly plant. The original culvert likely dates from 1872 or 1873 when the Air Line was built. Do these overpasses date from the Broad Gauge Days? The Grand Trunk was built to broad gauge but Wikipedia tells me it was all converted to standard gauge in the 1870s. These bridges were built in the 1910s, and are on a CPR line (not sure of the original railway) do my guess is no – they would’ve been standard gauge. It makes sense, but I find it interesting that the same bridge was used for road and creek crossings. I bet other examples exist – not viewable from the road. These works would date from the construction of what is now the CPR Belleville Sub. from Agincourt to Glen Tay around 1910. Something tells me that these are a CPR Standard design of the time. I agree: the fact the bridges are identical, despite bridging different things (a road and a creek) confirms that they were a standard design used to span gaps of a certain width and height. Check out the ROW plans for the Canadian Pacific Historial Association. There are a great series of plans of various concrete culverts. BTW, these culverts can also be cattle passes. I have a wholes series of photos showing construction of one of these structures near the community of Brooke, Ontario. Brooke is a couple of miles to the west of Bathurst Station (Wemyss) on the now abandoned Havelock Subdivision. You can see the culvert from Highway 7. Neat stuff, Philip. The CPHA has done a good job of sharing documents online. I hope they continue to expand their database. I didn’t find this particular style of bridge, but did find a lot of interesting stuff regardless. It was well worth checking out. Trevor the CPSIG has standard drawings for concrete culverts and a concrete cattle underpass in their online documents library. Do a search on concrete. 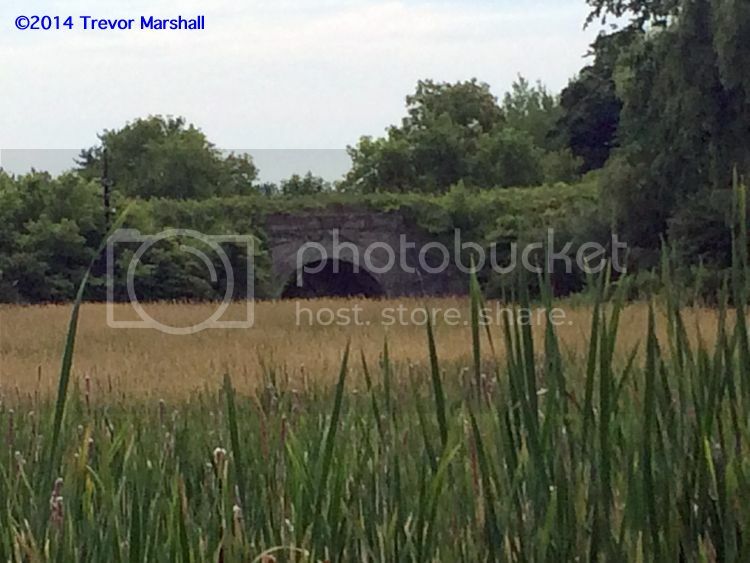 Trevor, correct, I did not see the highway underpass on the CP site but the culverts are there. If you look at your culvert photo closely, also visible on google stret view, you will note the top of the arch curves to the ground rather than hitting a vertical wall. I suspect somewhere deep in the CP corporate archives there is a standard drawing for a concrete road underpass. Actually, I wasn’t able to capture the whole bridge in this photo. The crops in the field get in the way. It’s more a bridge than a culvert – I would hazard exactly the same as the bridge at Westney Road. I’m sure it hits a vertical wall to each side. Regardless – it’s a cool bridge. I like the bit of decoration on the arches – not at all necessary for the function but they make it look nicer. The date cast into the top of the side is a nice touch, too. I will take better pictures of this bridge sometime when I have a camera with me. The photo in this post was shot on my phone, at maximum zoom, so it’s pretty grainy. Historical – or “hysterical” – research is fun! My pleasure to contribute to the debate. I am looking eventually to build a water tank with a stone base; they were on the O&Q, at least from Montreal to Perth, there was also one at Renfrew and I have recently seen a picture of one at Harvey, New Brunswick. The tank at Dalhousie Mills on the Winchester Sub is preserved, base and tank and used to hold water by the volunteer fire department. It will be the patten. I’ll make a nice model, Philip – I’m sure. I think I have a shot of that same culvert, Trevor. A great vantage point near 16th Ave. and the York-Durham Line. If it is the same culvert, it was built in 1910 during some upgrades to the Quebec and Ontario Railway line going to Peterborough and Havelock. Somewhere I have a 4 x 6 print of a cut stone subway on the GWR south of Branchton. If you’re interested, you can have copies of them. Thanks for joining the conversation. Yes – that’s the one, near 16th Avenue. I thought the date cast into it was 1910 – thanks for confirming that. The one up on Westney Road is 1911. I followed the line using the satellite view in Google Maps and it appears there might be a couple of other bridges between the York-Durham Line and Westney Road. They’re in the middle of fields, however, so not visible from the roads – unfortunately. Maybe in winter. I’ll have to give that a try. Some of the bridges are larger – but I also think I see evidence of culverts or cattle passages. I’d love to find a cattle passage that I could photograph… especially if it was on the CNR.